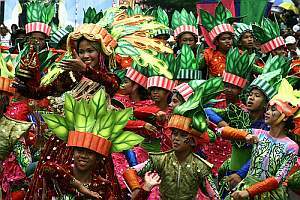 Cebu’s Sinulog Festival has become a significant part of the national tourism industry and a colourful component of the country’s Catholic heart. During the month of January, locals and tourists witness an outpouring of religious processions, concerts, beauty pageants and of course, street dancing. There is another event during the Sinulog that has also turned into a welcome part of the festivities - Boxing promotions that are open to the public. Even during the lean pre-Pacquiao years, free events like these have carried the torch for the sport. They were seen on a regular basis, even when there are no fiestas or festivals. The Gaisano Country Mall Carpark has been a favourite venue for these bouts. Fans remember watching the likes Randy Suico, Rodel Mayol, Rey Bautista, Z Gorres and Donnie Nietes in this venue even when they were still amateurs or unknown up and comers. During my low budget student years, I would jump at the opportunity to watch free fight cards being held right outside the malls or at public plazas. In the mid-1990’s, one of those I would regularly watch was an amateur named Eriberto Gejon. Gejon is now entering his tenth year as a professional. Yukka, as he is more popularly known, has come up short in two attempts at a world title in 2005 and 2007 and is undergoing a rebuilding process under the tutelage of the ALA gym. He was seen last October in Tagbilaran City after a seven month layoff and won a hard fought decision over Brix Ray. Gejon will be making his second appearance in the Summit Fight Night Tour against Roldan Castrodes this coming Sinulog Sunday. Castrodes fought in Compostela last month and lost his PBF jr. flyweight crown to Rodel Quilaton by unanimous decision. This was his first career loss. The protagonists intend to put a positive spin into their careers. One of the great things about boxing is that a boxer is just one punch or one fight away from doing just that. Other match-ups in the continuing Summit Fight Night Boxing Tour at the Gaisano Country Mall include: Jomanz Omanz vs. Carlo Magale, James Bacon vs. Jaypee Ignacio and Roli Gasca vs. Greg Mangan. Omanz and Gasca were also fighting in this venue January last year. The 18 year old Omanz has an impressive record of 11W – 1 L – 1 D with 6 KO’s. James Bacon was also part of the October Summit Fight Card in Bohol and scored a 4th round KO win over Jojo Arnado. Boxing fans can expect 46 exciting rounds and make this an opportunity to size up the emerging ALA fighters. Top photo: Dancers during Cebu's Sinulog festivities.